Staff Sgt. Adam S. Thomas is a native of Lyon County, Minnesota. He enlisted into the Army in April, 2008 at the age of 22 as an 11B Infantryman, completing both Basic Training and Advanced Individual Training at Fort Benning, Georgia. He was a specialist when he was assigned to 3rd Infantry Brigade Combat Team (Airborne), 82nd Airborne Division at Fort Bragg, N.C. where he served as a rifleman, Sniper, and Scout Squad Leader. He excelled in Soldiering and Leadership during his years with the 82nd and quickly attained the rank of Staff Sergeant. He deployed twice with the 82nd as an infantryman, a 12-month deployment in 2008-2009 to Iraq, and a 9-month deployment in 2011-2012 to Afghanistan. 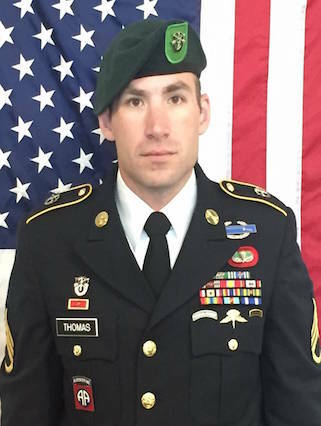 In 2012, Thomas successfully completed the U.S. Army’s Special Forces Assessment and Selection Course. He graduated the Special Forces Qualification Course in October, 2015 and was assigned as an 18D Medical Sergeant to 10th SFG (A) in February, 2016. He deployed with 2nd Battalion, 10th SFG (A) to Afghanistan in support of Operation Freedom’s Sentinel June 19, 2016. Modern Army Combatives Level I, Basic Airborne Course, Ranger School, Special Forces Sniper Course Level II, Warrior Leader Course, Special Operations Combat Medic Course, Advanced Leader Course, Special Forces Qualification Course, Survival Evasion Resistance Escape (SERE), and Basic Military Freefall Parachutist Course. Staff Sgt. Thomas’ awards and decorations include: Bronze Star Medal, Purple Heart Medal, four Army Commendation Medals, Iraqi Campaign Medal, Afghanistan Campaign Medal, Global War on Terrorism Service Medal, Noncommissioned Officer Professional Development Ribbon 2, Army Service Ribbon, Overseas Service Ribbon, NATO Medal, Special Forces Tab, Ranger Tab,. Combat Expert Infantry Badge, Parachutist Badge, and Military Freefall Badge. Staff Sgt. Thomas is survived by his Wife.